Having your child's birthday party at a local park has a lot of advantages: It's outdoors, there's plenty for everyone of all ages to do, and, best of all, you don't have to clean the house! 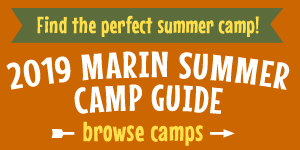 Here are 12 terrific Marin parks that are perfect for parties. Our criteria were that they had to have plenty of space for games and the obligatory bounce house, group picnic areas, preferably with BBQs, and decent parking. Here's our list in alphabetical order. Needless to say, reservations for group picnic areas must be made in advance; we've linked each park's name to its web page where you can get full contact information. The side of a long-gone mansion, Gerstle Park boasts plenty of lawns, a new playground, and picnic areas, plus lots of places to explore. San Rafael Avenue, San Rafael 94901. Located across from Marin General Hospitcal in Greenbrae, Hal Brown Park at Creekside features awesome playgrounds, plenty of fields and picnic areas, and amazing views of Mt. Tam.